You’ve seen Pharrell’s video “Happy,” right? This video is a parody video. In other words, it’s almost the same song, but it has funny new words. The musician is “Weird Al” Yankovic. He was very popular with people my age when we were young. He’s still making funny songs, so I’m still a fan. It’s kind of tacky to give her a present that someone else gave you. – Wearing a lot of brand logos, like Chanel, Gucci, Louis Vuitton, etc. Similar words: crass, crude, tasteless, over the top, kitschy, inappropriate. You can read about the Rim Fire in California here. The article is long, but it’s not difficult. I’ve made a Tumblr for English vocabulary. Mostly, I’ll post English words and phrases that have been changed when they are used in other languages. There won’t be a lot of writing. You can look at the word and look at the photo to see what the words means in standard (American) English. I hope it’s useful! Some hackers attacked my websites. :( I have to make some changes. My website will look plain for a little while until I fix it. I’m sorry. If something doesn’t look right, please wait. I’m still alive! I am enjoying my new job, but I have been even busier than I expected. How about joining me on Facebook? Readable Blog is on Facebook! It doesn’t take much time to write a Facebook post, so I post there more than I write here. I’m also @readable on Twitter. I will try to work on the Facebook posts for this blog (about how to use Facebook safely and how to make it interesting). If you have specific questions you want me to answer, please ask. That will make it easier for me to write the posts. Right now, I want to tell you about a free site called Lyrics Training. At Lyrics Training, you can watch a music video with English words. At the same time, the words are shown under the video — but some of the words are missing! You need to type in the words while the song plays. There are harder and easier levels, and you can find old and new songs. If you like music, it’s a good way to improve your listening. Remember that song lyrics often have strange or poetic words and grammar. Still, they’re fun and a nice way to enjoy learning English. 2. Change it to your language if you’d like to make it easier. Languages are at the bottom of the page. You can switch languages any time. 3. Enter your name and other information. Yes, you should probably use your real name. Why? Because it will help your friends find you. (Also, Facebook requires it.) You can hide all of your other information from people that you don’t know. 4. There will be a “captcha” image. Type in the words to prove that you’re a real person. Click “try different words” if you can’t read it. 5. Facebook will offer to look for your friends who are already on Facebook, using your email. This is a good idea if you have a compatible email service, but be careful. First, it will ask you to log in with each account if you’re not logged in. Then it will ask you to agree and continue. Click the box to the left of anyone you want to add as Facebook friends. Click “Add as Friends.” (If there wasn’t anyone you wanted to add–for example, it was just people from your job–click “Skip” (cancel/etc.)). DANGER! Be VERY careful to not accidentally email your entire address book in this step! Now it will say “## contacts aren’t on Facebook or haven’t listed their screen names.” You can invite people or skip (not do) this step. I think you should click on “Skip” — don’t invite anyone here. If you do want to invite a few people, click on “Invite some friends.” Do not click “Invite All Friends.” So click “Skip.” You can come back to this page later. It is very useful as long as you don’t accidentally invite everyone! 8. Now you’ll see your main page. Of course, it’ll be pretty empty right now. There will probably be a notice at the top that says “Go to your email to complete sign-up.” Facebook should have sent a confirmation link to your email, something like “Just one more step to get started on Facebook.” Look for it in your email. Find the link in the email and click on it. 10. The next thing you should do is fix your security settings, which I’ll write more about later. After that, you have two more fun things to do: Finish setting up your profile and go look for more friends. I’m going to stop here, though. If there’s anything that you’re confused by, or worried about, PLEASE ask! If you have advice or suggestions for other users, please tell me. Next I’ll talk about how to enjoy using Facebook and how to stay safe! For me and most of my friends, Facebook is a good way to connect with our real-life friends and family. Unlike Twitter, the people that we are “friends” with on Facebook are usually people that we know well. We also use Facebook to become “fans” (or “like”) the pages of businesses that we use a lot, brands that we like, media such as newspapers and TV stations, celebrities, local government and nonprofit groups, publishers and educational organizations, school and alumni groups, and so on. I use updates from the Facebook pages two ways: First, I read and enjoy the updates myself. I get more information this way than on Twitter, since it’s not limited to 140 characters. I can watch videos or look at photos from inside Facebook. Some Facebook pages also have contests and coupons. (There are games and apps, too, but I don’t usually do those.) I comment on some of the interesting things. I also click “like” on stories, photos, and videos that are interesting and useful to me. Second, when I see something that I think my Facebook friends would also like, I click “share.” This means that my Facebook friends will see it, too. They can comment on it, “like” it, and share it, too. Unlike Twitter, when my friends comment on it, they’ll all wind up talking together, which is nice. It’s this mix of entertaining and useful news, video, and photos from all over the world, plus my friends from all over the world commenting together, that makes Facebook something I like. Also, it doesn’t take much time to use. If I want to share something I see on Facebook, it only takes a second to click “share” and type a comment. If I want to share something I found somewhere else, I just paste in the URL. Facebook makes it a link automatically. It’s faster than blogging, but there’s more detail than Twitter. In the last two days, I shared some news about a charity for tornado victims in the southeast US, a comic strip about English vocabulary, a news article about a 9/11 memorial, and a music video. I clicked “like” on a lot of things, including my friend’s status update (kind of like a tweet) that she was accepted at a university, a message from a local park page announcing a free festival, an article from a travel magazine, etc. I also commented on lots of status updates and a few other things. Oh, and I entered a contest win an around-the-world airplane ticket! Heehee. Finally, one thing that a lot of my friends do is play games and use other “apps” (mini-programs) inside of Facebook. Mixi started to also use this idea a while ago, and so did other SNSes, so you might be familiar with it already. Some of the games are really pretty good. In some other posts, I’ll tell you how to get a Facebook account, how I use Facebook (literally–where I click and so on), how to stay safe, and how I think you can best enjoy using it. Later, I’ll add some pages to this blog with more details (like my Twitter pages). 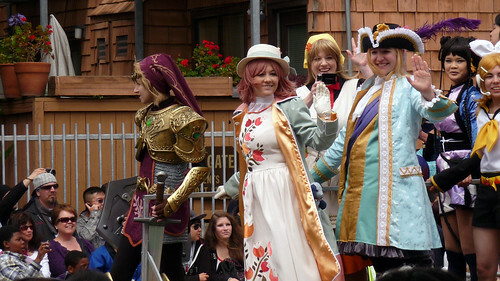 I went to the Northern California Cherry Blossom Festival in San Francisco’s Japantown neighborhood yesterday. It’s held every year on two weekends in April. Of course, it’s only been 5 weeks since the disaster in Japan. Maybe the organizers were not sure about whether to have this fun event this year. 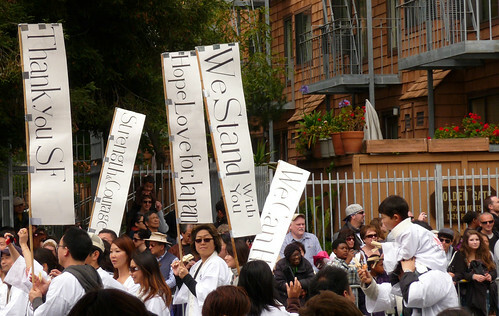 However, it’s really important to the Japanese and Japanese-American community here. 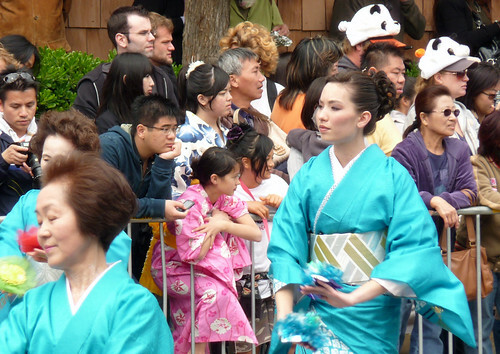 For example, it helps Japanese and Japanese-American kids living here learn about and participate in Japanese culture. It’s also really important to the businesses in the area. So the festival was held as usual. However, you couldn’t forget about the disaster: there was fundraising everywhere. I thought that was good. Anyway, here are some of my photos. We walked through downtown on our way to Japantown. That’s where the parade starts, so some of the people who were going to be in the parade were eating lunch and getting ready. Here are some of the empty floats. The one with the dolls is a special one to support Japan and encourage donations. It was really big and beautiful. 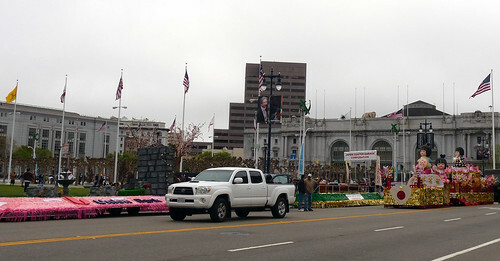 This is during the parade. I don’t know what group it is. 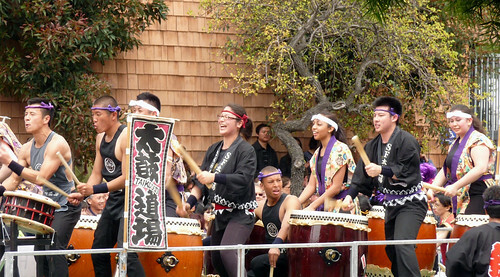 There are several Japanese drumming groups that perform during the festival or in the parade. They’re really popular. This isn’t a real cable car, but it looks like one. They’re tossing candy to people in the crowd. That’s common in American parades. These dancers are from a Californian Japanese dance school. Both small children and older people danced all the way from downtown–about 1 mile/1.5 kilometers away. Dancers, cheerleaders, etc. are common in American parades. 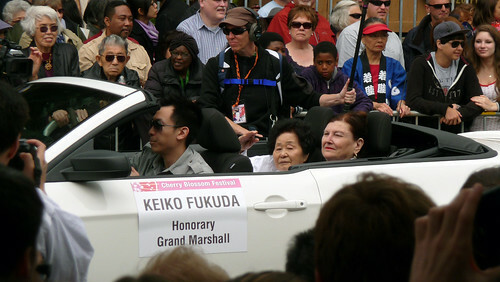 Ms. Keiko Fukuda was the Honorary Grand Marshall (leader) of the parade. She’s a famous judoka (also see this video about her). The mayor and the Japanese consul were there too…last year we saw Japanese-American actor George Takei (Sulu from “Star Trek) and the Japanese ambassador to the US. 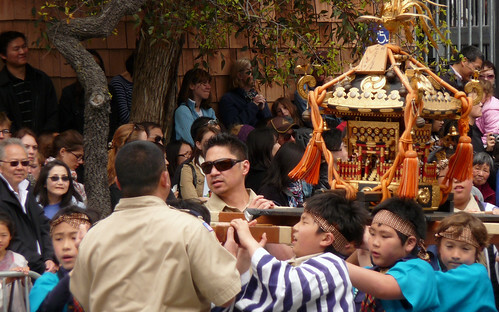 These Boy Scouts have a small omikoshi (Japanese portable shrine). There’s a really big one at the end of the parade, but I didn’t stay this year. During the rest of the festival, there are outdoor stages with music. 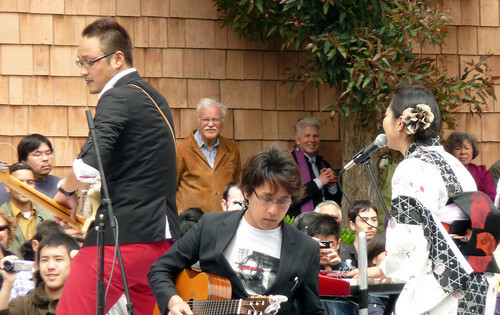 This band from Japan, Soulit, performed on a float during the parade, too! They sounded pretty good. 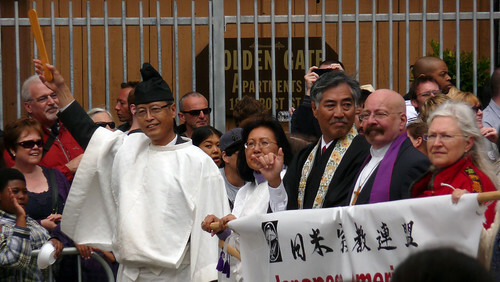 This is some kind of Japanese/American inter-faith religious group…They look pretty interesting, don’t they? 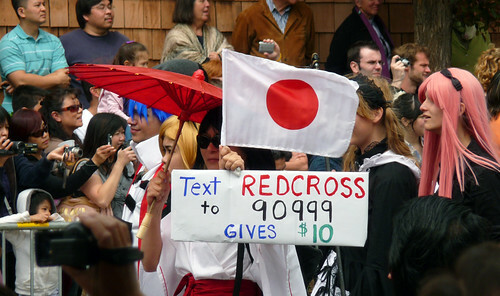 This participant carried a sign encouraging people to donate to the Red Cross by text. 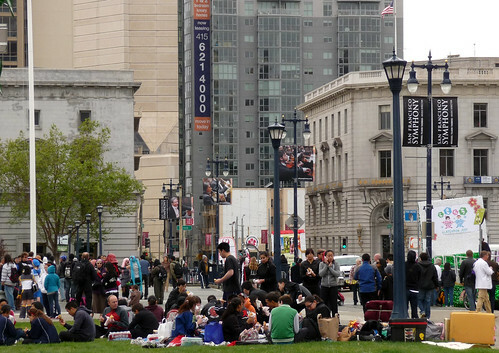 During the festival, the Japantown mall is really busy. 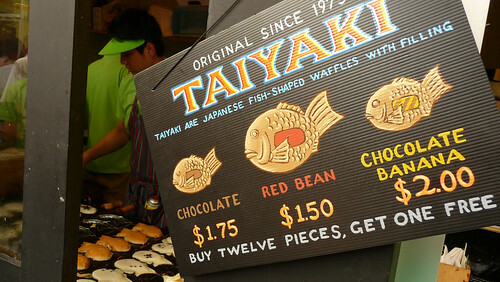 There’s a coffeeshop that always sells their own special taiyaki (like a filled waffle), but they must sell hundreds during the festival. Of course, I had one. I also had mitarashi dango (a kind of sweet rice dumpling on a stick) at a tea shop. My husband had shaved ice. 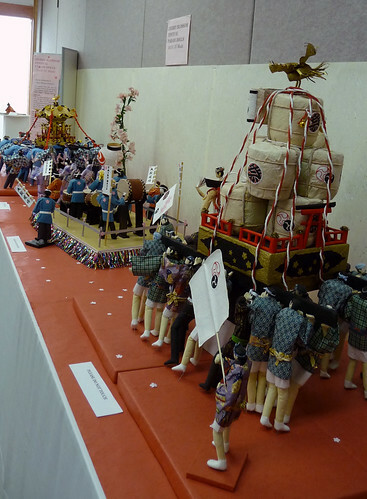 There are several displays of arts and crafts during the festival, including origami, cloth-covered wood dolls, and these dolls made of paper. There are also displays of bonsai, antique swords, ikebana (flower-arranging) and stones. They also have demonstrations of martial arts (kendo, kyudo, naginata, judo, karate, aikido, etc. ), various kinds of dancing and singing, musical performances on the shakuhachi, koto, and shamisen, and they even play karuta (a kind of card game). 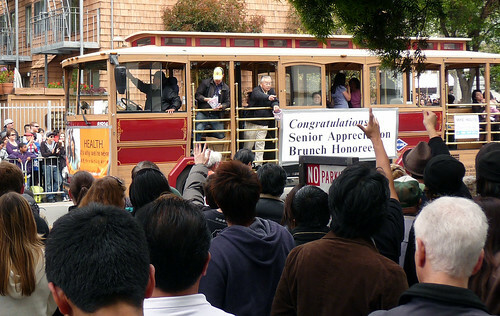 Some of the people doing these things are not Japanese or Japanese-American at all. There are other things to do, too. There is one outdoor area where people sell things like t-shirts with original designs, jewelry, and handmade soap. These things have to be related to Asian culture in some way. There’s another area where community groups like Buddhist churches and bilingual kindergartens sell food. You can buy “sakura popcorn” (rice crackers, seaweed, and popcorn), onigiri (riceballs), takoyaki (with no octopus for people who are scared), and lots of other things. I couldn’t take a good photo of these areas. If you ever have a chance to visit the festival, I recommend it. It’s a wonderful combination of Japanese and American cultures. You can see more photos from this year on Flickr, including some amazing origami, more cosplay, and a model of Osaka Castle. If you have any questions about anything, just ask!